The Hopeless Bibliophile: Tomorrow, When the War Began: THE MOVIE! 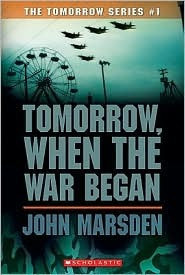 John Marsden is a brilliant author, and Tomorrow translates incredibly well to the screen. Some of the actors weren't quite what I had envisioned in my head - Robyn, mostly - but they quickly proved that they could breathe life into these characters. The locations were both breathtaking and perfect. Really, the only way this could have been better would be to make it longer. Having more screen time would have been nice - a tv show would have been perfect, with each chapter or two making up an episode. But since we can't always get what we want, this movie was exactly what it needed to be. There were a few changes that I wasn't really sure why they were necessary, mostly Flip's fate, Robyn not being an athlete, the ending to the bridge scene, and which car Kevin and Corrie took. I was also a little confused about how the kids got down into Hell and was disappointed that they didn't show the discovery of the path down. There were also a few things left out, such as the entire storyline with the hermit. I was a little disappointed about these changes and omissions. Overall, though, the writers and actors made up for this with their hard work - especially Caitlin Stasey, playing Ellie Linton, my childhood hero. It's been less than a year since I last read this series and The Ellie Chronicles, but I miss them already. It may be time for a re-read soon!